RAPAPORT... Angola is seeking stronger ties with Antwerp as the southern African nation looks to improve the profitability and transparency of its diamond sector. The country has failed to benefit sufficiently from its diamond resources due to government policies, according to its president, João Lourenço, who came to power in September and is planning to reform the industry. Catoca, the country’s largest diamond mine, lost $464 million over the past six years because producers were only able to sell goods through Sodiam, the state-owned trading company, Reuters reported Monday, citing an internal Catoca document. That policy has restricted miners’ revenues, as Sodiam could choose to whom it sold diamonds, often resulting in politically connected buyers obtaining goods at below-market prices, Reuters said. Engaging in trade with Antwerp could present an opportunity to create value, according to Nishit (Bali) Parikh, president of the Antwerp World Diamond Centre (AWDC). The Belgian city has a track record of generating a 15% premium for producers that export their goods directly to the hub rather than shipping them elsewhere, Parikh said in a speech during Lourenço’s visit to Antwerp last week. Antwerp is the first diamond trading center Lourenço has visited as president, the AWDC claimed. Angola’s transformation would involve both increasing rough production and creating more employment through local processing and polishing, Lourenço added. Angola currently only exports 1% of its rough diamonds directly to Antwerp, but some 50% end up in the city, Parikh noted. The African nation ships 70% of its diamonds to the United Arab Emirates, according to Reuters. “If I can do better business by trading my goods through the market in Antwerp, why would I send my goods somewhere else first, and then let someone else get a better deal by sending them to Antwerp?” Parikh said. Selling straight to Antwerp would also “show the world you are serious about fostering transparency, and intend to follow through on your message of change,” the diamantaire continued. Lourenço has embarked on a reform agenda since taking over from José Eduardo dos Santos, whose controversial rule lasted 38 years. Through those changes, the nation hopes to attract more foreign diamond miners, Reuters quoted Lourenço as saying. Alrosa — the largest rough supplier to the Antwerp market — currently holds 41% of Catoca, which produced 7.2 million carats in 2016. The Russian miner is also an investor in Angola’s new Luaxe mining project. Angola’s total output was 9 million carats in 2016, including other smaller deposits such as the Somiluana and Lulo mines, according to data from the Kimberley Process. The country plans to double its annual production by developing Luaxe, which, at full output, it expects to yield 10 million carats annually, Reuters reported in 2016. Sodiam and its parent company, Endiama, could not be reached for comment. 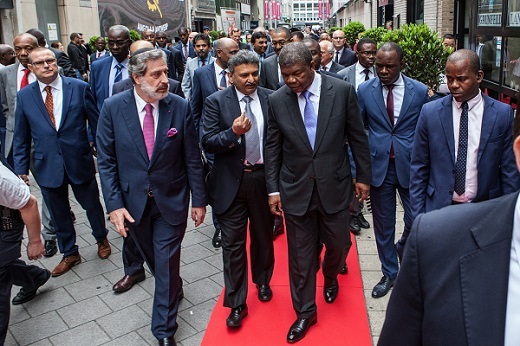 Main image: AWDC president Nishit Parikh (center) talks with Angolan President João Lourenço in Antwerp. Inset: Lourenço with AWDC officials. Images courtesy AWDC.